For any Hello Kitty fan, the idea of owning a cute toaster with that delightful Hello Kitty design on it is definitely appealing – but quite frankly there’s more to the Hello Kitty toaster than that. While it may seem surprising, these toasters are more than just fun toasters and come with some great features too. If you’re thinking about adding it to your Hello Kitty kitchen then it would be good to know what it can do. What Makes the Hello Kitty Toaster Stand Out? It goes without saying that a bright pink toaster stands out on its own when it comes to looks, particularly when it has a huge Hello Kitty face on its side. However what really makes this funny toaster so appealing is the fact that it actually emblazons a Hello Kitty picture on one side of every toast that comes out of it – which is bound to appeal to most fans. Of course if you want to use it as a picture toaster you should be aware that the picture is only really clear on white bread. Aside from being funny toaster with a novelty gimmick, it also comes with the customary ‘Reheat’, ‘Bagel’ and ‘Defrost’ settings as well as 7 browning levels that can be selected by turning the dial. 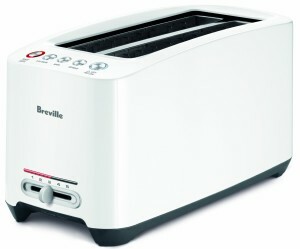 It can only accommodate 2 slices of bread in its 2 slots, but each slot is extra-wide and the high lift carriage ensures that even small pieces of bread can be easily removed once toasted. To add to that the Hello Kitty toaster is designed to constantly be cool to the touch and its toy-like exterior is surprisingly sturdy and durable. As you’re probably starting to realize - as much as it may seem like a toy, it is anything but. As one of those cool toasters that has a great little gimmick, the Hello Kitty toaster certainly does excel. However what makes it more than a cute toaster and actually a really attractive option is the fact that its price point is impressively low when you consider the features that it brings to the table. Although it may look like a toy at first glance, it is actually a sturdy and durable toaster that is more than capable of delivering great toast complete with a Hello Kitty image. For Hello Kitty fans, this toaster is a great item to own and will constantly be a source of amusement for yourself as well as your friends and family.